USD/CHF has a potentially good setup depending on fundamental direction to “trade the break” ahead of United States GDP data and the Switzerland KOF report both due out tomorrow (see below for definitions of both). 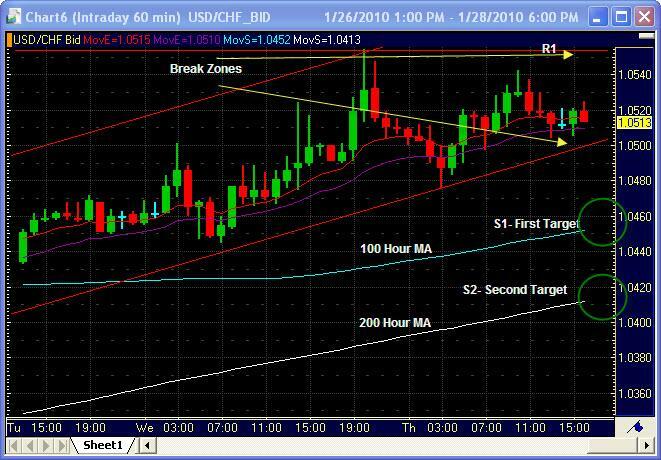 Right now USD/CHF is trading around 1.0520 with immediate support on the hourly chart sitting at 1.0510 shown by the red trend-line below the price. Resistance is seen above at the previous high from yesterday at 1.0554. A “break” below the trend-line could yield to the next target resistance (R1) around 1.0460 and onto the next target (S2) around 1.0420 with a breach there possibly 1.0366 which was the low from last month seen on a 4-hour time-frame. A break above will see immediate resistance around 1.0574 (the 200 day MA not shown on this chart, and a breach above that to yield higher highs not seen since September of 2009 between 1.0600 and 1.1000. One thing to keep in mind is to watch the fundamental news events for signs of weakness and strength in USD and Swiss franc respectively (GDP and KOF). Remember, look for a confirmation of the break or set a sell-stop, or buy-stop at a reasonable level above or below the prices because of the possibility of not getting filled with a market order. Another good strategy from my previous post in this series is to wait until the break, then the re-touch for a better entry point. I mentioned earlier that we would discuss exit points as well. An exit point depends on your strategy, usually when you trade a break, you can look for the next support or resistance level as your exit point. And if it breaks through you can hold your trade or a portion of to the next level. You can also look at Japanese Candlesticks to determine an exit point. (see reference here) for both short and long time-frames. Most novice traders will hold losses way too long and cut wins way too short. Know when a loser is a loser and get out so you can live to fight another day. Don't add to loosing positions, you're already wrong my friend, so use your money management skills, be disciplined, and don't get caught in the common mistakes that we have all gone through early in our trading careers. Remember there are 10 cardinal rules for trading that you need to abide by. GDP- Gross Domestic Product - GDP Measures the value of goods and services produced. KOF- The KOF Swiss Leading Indicator is released by the Konjunkturforschungsstelle Swiss Institute for Business Cycle Research and it's a joint survey with leading indicator which measures future trends of the overall economic activity. It captures the movement of GDP growth and the economic trend in Switzerland. An optimistic view is considered as bullish for the CHF, whereas a pessimistic view is considered as bearish.